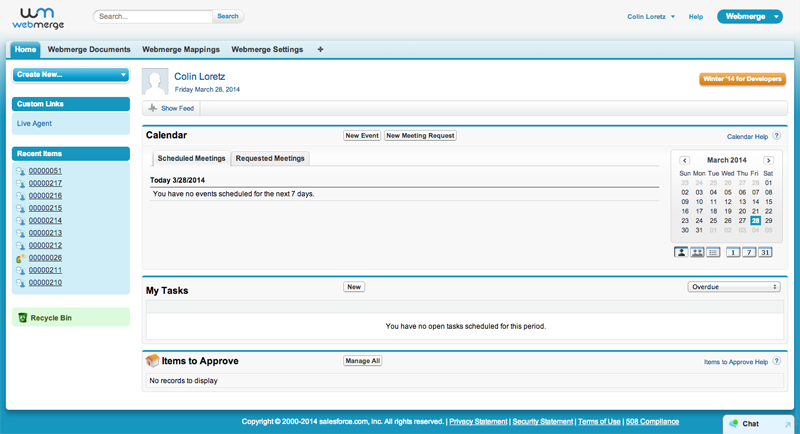 You can access WebMerge for Salesforce.com at any time in your Apps dropdown in the top right of Salesforce. These Tabs are where you will be able to manage your WebMerge document mappings and settings. 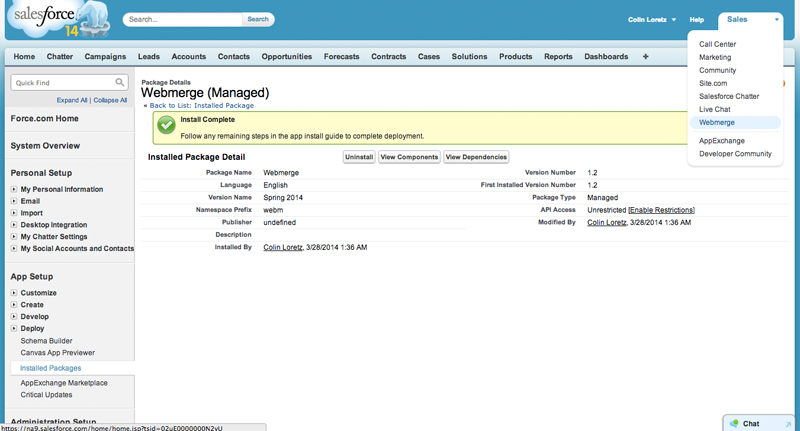 To give Salesforce.com access to your WebMerge documents, we need to setup an API Key and API Secret in WebMerge. Visit www.webmerge.me and either sign in or create a new account. Under your Profile, click on API Access. 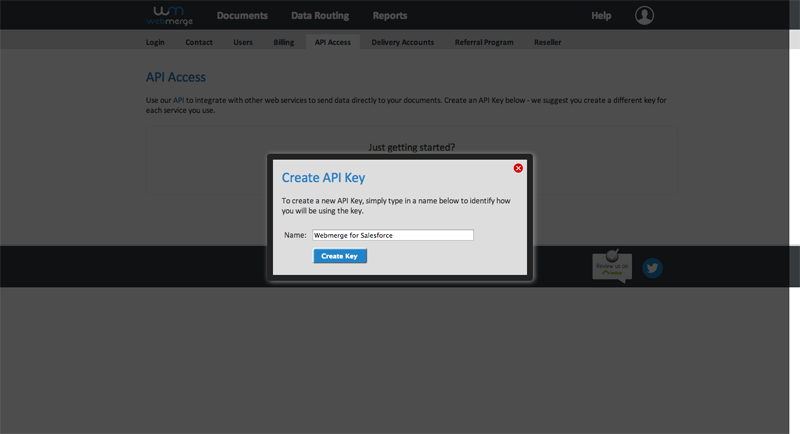 Click on Click here to create an API Key! to get started. Give your API Key a name. 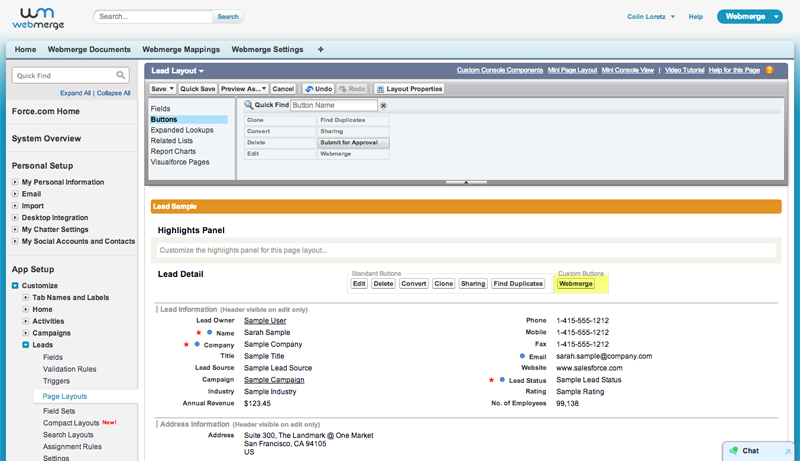 For this example, we’re going to call it WebMerge for Salesforce. 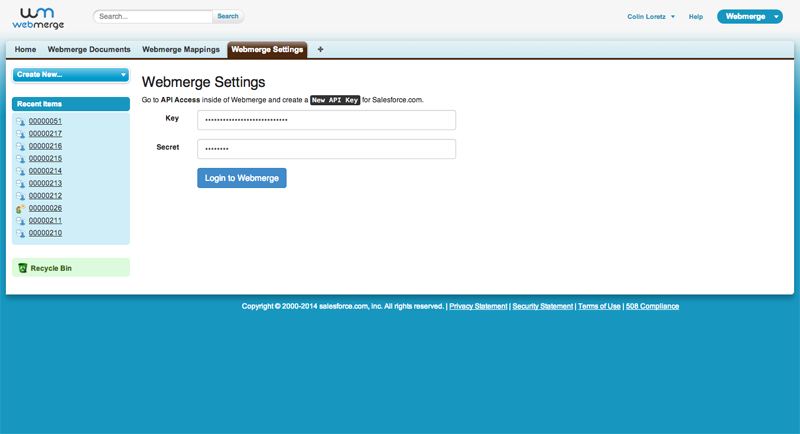 Now you want to copy and paste the API Key and API Secret from WebMerge into WebMerge for Salesforce.com settings. 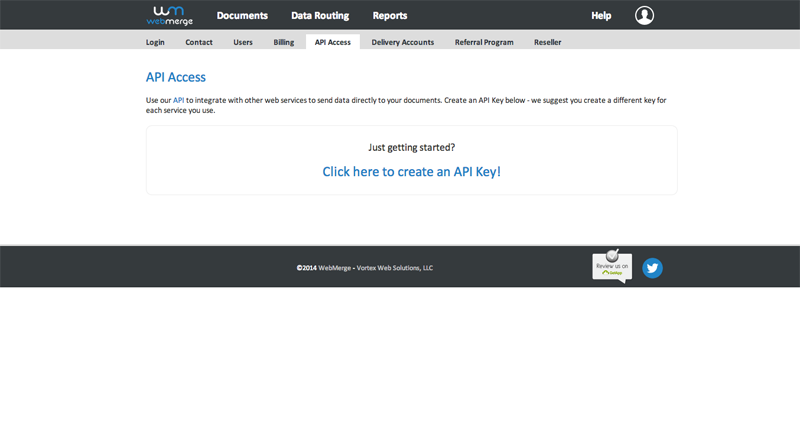 Click Login to WebMerge using your new API credentials. If everything was entered correctly, you’ll be logged in. 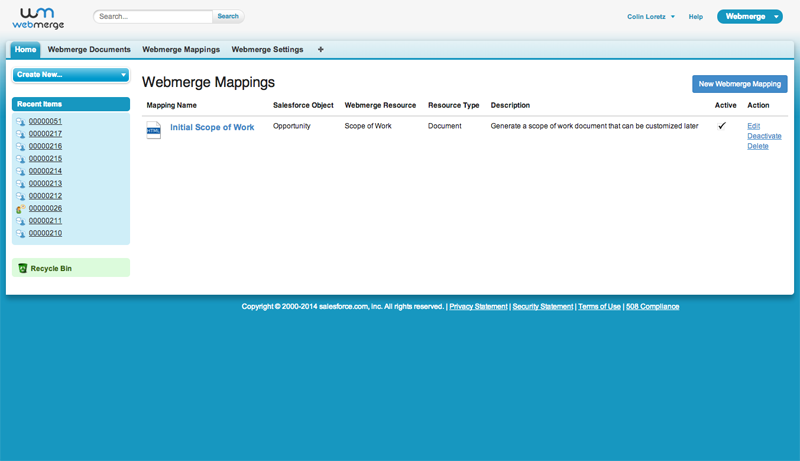 Now that you are logged in to WebMerge, you can view the WebMerge Documents and WebMerge Mappings tabs. Click on WebMerge Documents and you’ll see that we have given you full access to your WebMerge account right within Salesforce. 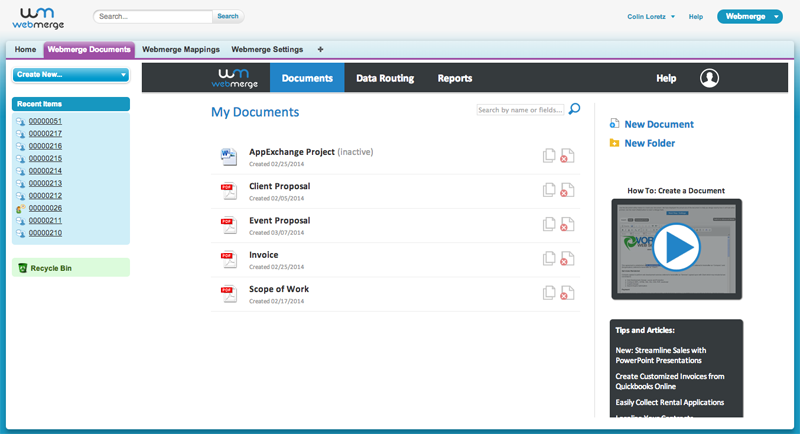 You can create new Documents or Data Routes here and they will be available to be used in the WebMerge Mappings tab. WebMerge for Salesforce allows you to create WebMerge document mappings using data from Salesforce.com records. Click New WebMerge Mapping to get started on creating a new mapping. · Mapping Name: Give this mapping a name that will be descriptive to you and your users. · Description: Give users a description of what this mapping does or what use case it was created for. 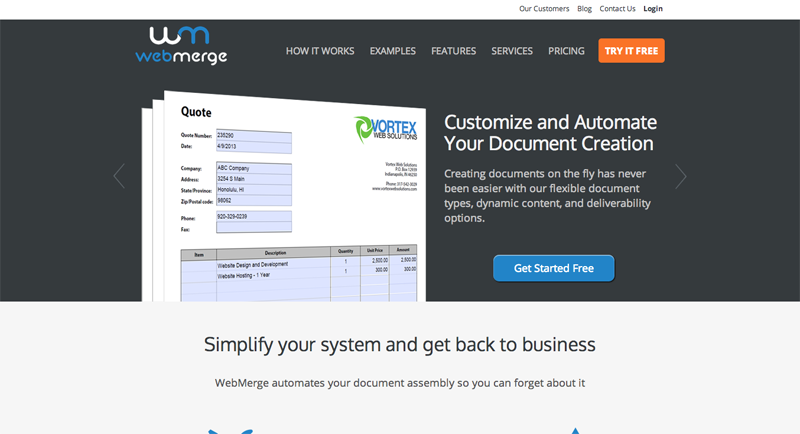 · Select a WebMerge Resource: WebMerge allows you to create Documents or Data Routes. You can toggle between both types of resources here. 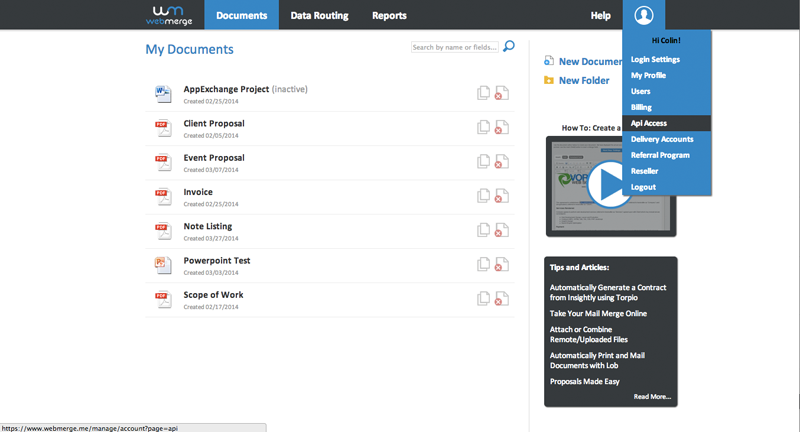 Selecting Documents will give you access to a list of available, active Documents in WebMerge. · Select a WebMerge Document (or Route): Select the specific Document or Data Route from WebMerge you’d like to create a mapping for. · Run in Test Mode? This option will allow you to test your mapping while you’re designing it without using up your quota of document merges. Documents created in Test Mode have a WebMerge watermark. Click Save and Next to continue on to Field Mapping. 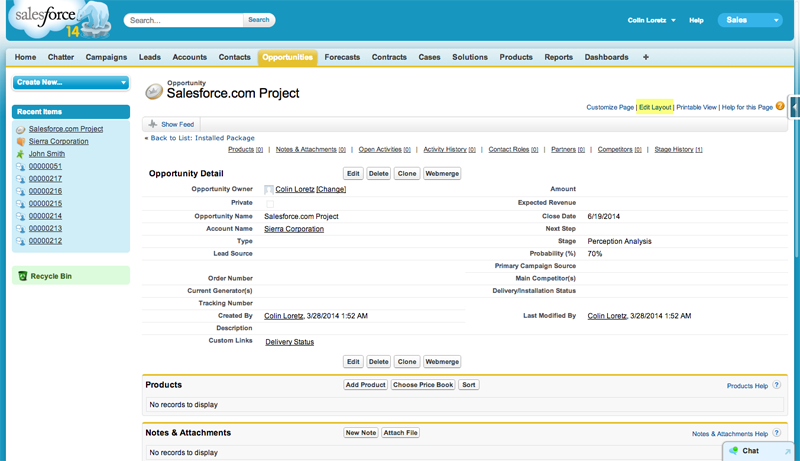 Now that we have created a new WebMerge Mapping, we are presented with a series of WebMerge Fields that we can map to existing Salesforce.com fields on the Salesforce object that we selected on the previous screen. 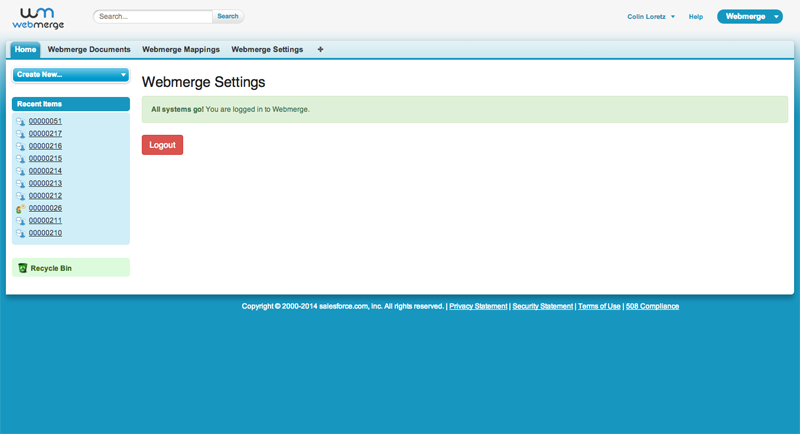 Note: Changing a WebMerge Mapping’s Salesforce Object or WebMerge Resource is not currently supported. A new WebMerge Mapping has to be created if you wish to change these values. · Fields from parent records like Owner, Account, etc. · Child Relationships. See Working with Child Relationships for more information on using Child Relationships in your WebMerge documents. 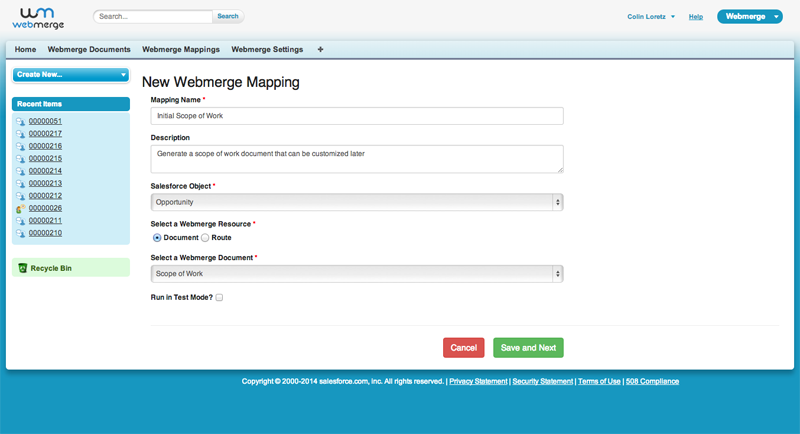 With WebMerge you can automatically have a WebMerge Mapping generate a document when specific criteria are met. · Created - this will evaluate the rule every single time a record is created. If the rule criteria are met, the document will be created. · Created, and every time it’s edited - this will evaluate the rule every single time a record is created and every single time the record is edited. If the rule criteria are met, the document will be created. · Created, and any time it’s edited to subsequently meet criteria – this option will evaluate the rule every time a record is created any every time the record is edited and did not previously meet the criteria. 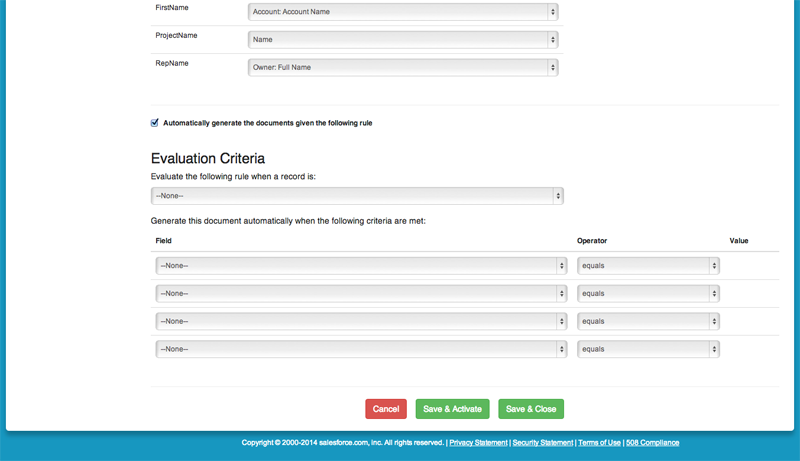 Once you’ve selected the evaluation criteria, you can select up to four criteria that must be met in order for the document to be generated automatically. You have access to the fields on the Salesforce Object that you selected when creating the WebMerge Mapping as well as fields from parent objects like Owner.Name or Account.Name. 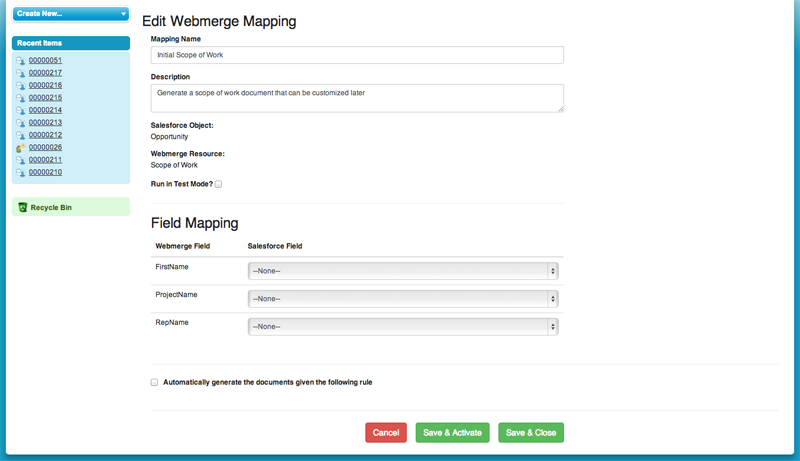 As you build your WebMerge Mapping, you can save it and return to it at any time as you gather requirements and design your document in WebMerge. If you are working with a new mapping, you can Save & Close or Save & Activate. If you choose to Save & Close, you will be able to activate the mapping later. 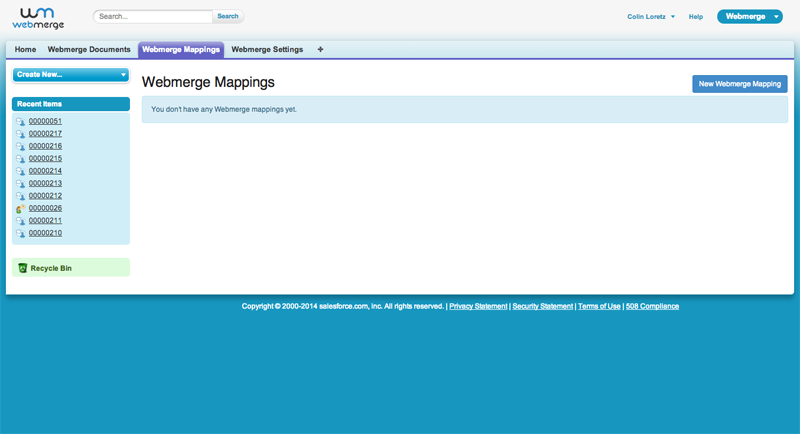 Once you activate a mapping, it will be available to your users through the WebMerge button on a record. If your mapping has been configured to automatically generate documents, those rules will now be active as well. 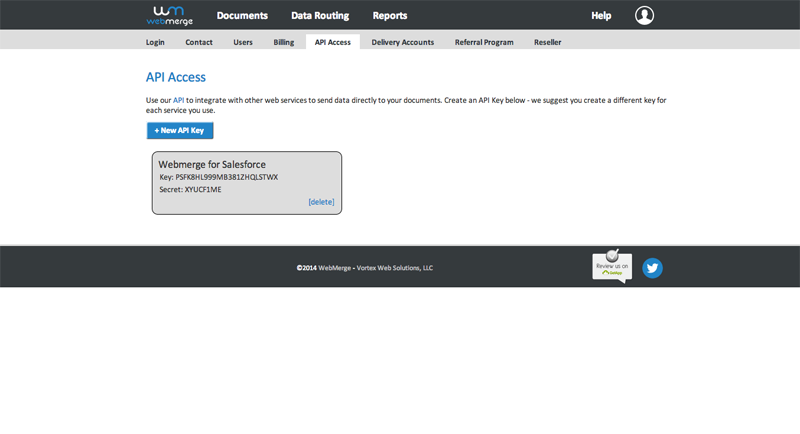 Not only do you have the option to setup criteria for generating documents automatically, users can also generate documents on demand using the WebMerge button on a Salesforce record. 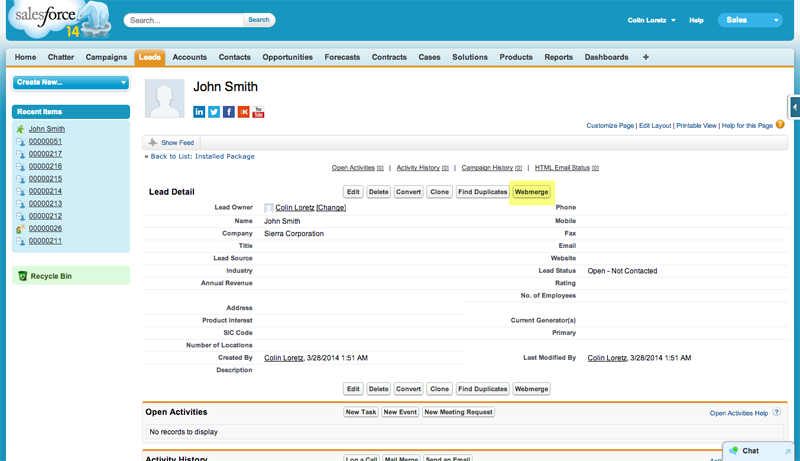 The objects currently supported by WebMerge are: Account, Case, Contact, Contract, Lead and Opportunity. View a record from each of these objects and click on Edit Layout in the upper right menu. Click on the Buttons section and you will see a WebMerge button. Drag the WebMerge button into the Custom Buttons section of the Page Layout. Save the Page Layout and you will now see the WebMerge button on the detail record. Repeat this for each of the supported Salesforce objects.